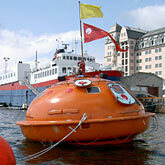 Undertaking its maiden voyage across the Baltic for ISEA 2004, the LifeBoat project was a collaborative trans-disciplinary work. LifeBoat is a prosaic title indicating both the physical reality (the project was contained within a fully weatherproofed ship's lifeboat) and somewhat more conceptually, as the lifeboat became home to a biotechnology laboratory; a home to the processes of life itself. On a metaphorical level, this project was designed to deal with concepts of sustainability, survival and notions of biological, cultural and ideological re-generation, and naturally its obverse, the degradation of life and all its manifestations.